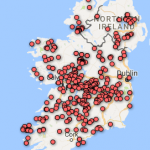 Evictions occurred in Ireland when tenants could not pay the rent? While this might be the simplistic view it is not the full story. Inability to pay the rent was usually the reason, but there were also a number of other explanations. Unreasonable and unjust rent increases or landlords consolidating land from smallholdings that had been divided and sub-divided was another reason. Quarrels and disputes between the chain of ‘middlemen’, agents and owner/landlord often ended in the ejectment of the unfortunate tenant who became a pawn in their disputes. But I then went to FindMyPast.ie where Ireland Valuation Office Books, threw up the very record I was looking for. Six different books or notebooks were prepared by the valuers before the final valuation (1852 in this case) was completed. They are Field Book, House Book, Quarto Book, Rent Book, Survey Book, Tenure Book and they date from 1848 to 1852. Notes, observations and descriptions are handwitten into the books and as such are the original notes (not transcriptions which may have errors). In the House Book (1848/1849) I found my emigrant family with a line drawn through the name and a pencilled note ‘levelled’. This one word ‘levelled’ told me what I wanted to know. 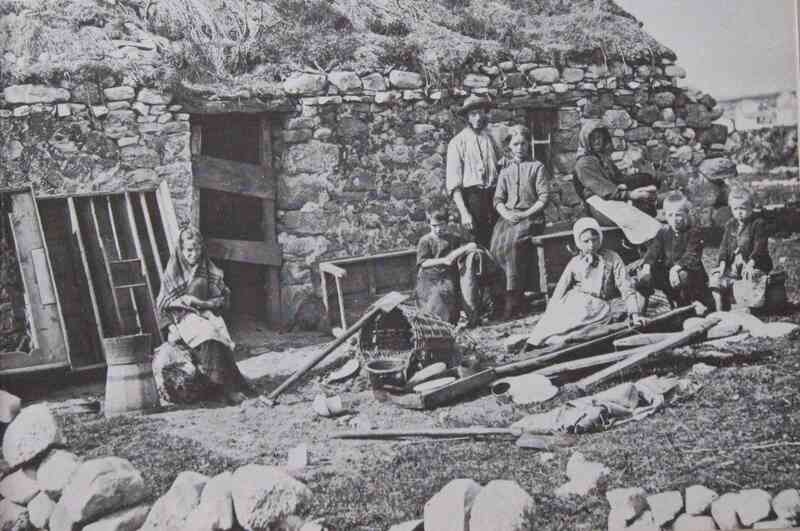 When a family was evicted the house was then ‘tumbled’ as described in newspapers of the time. This was to prevent the family re-entering or trying to fix it back up again. 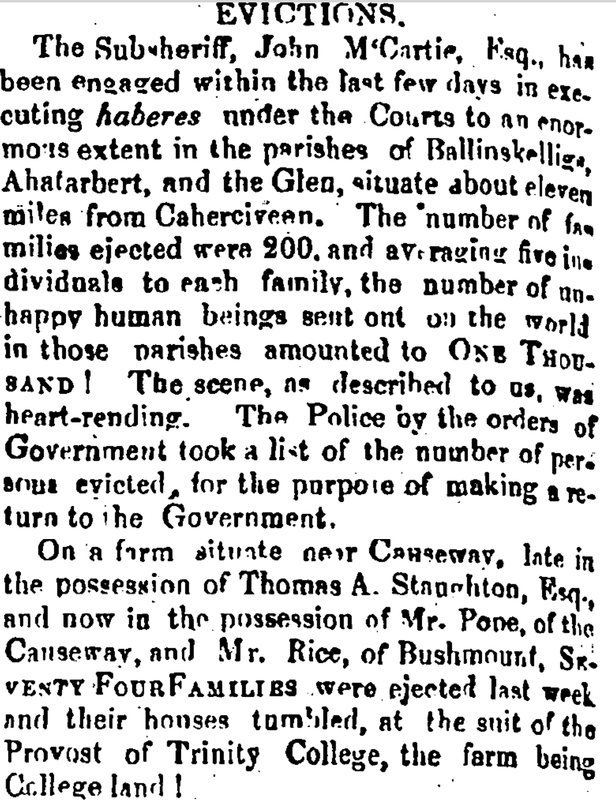 In the case of this family, the record showed that they had lived in the parish, in the particular townland and they had emigrated immediately after the eviction. I will be posting a series of eviction stories in the coming weeks. 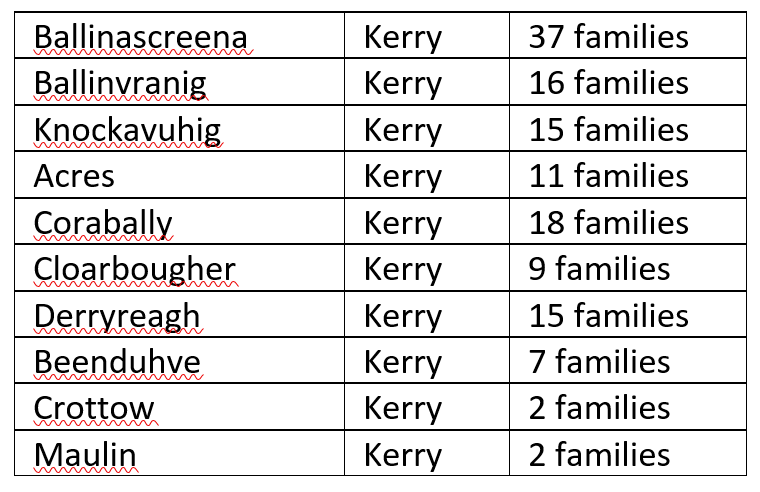 While some of these date from the Great Famine era (1845-1852) there were also quite a number of Kerry evictions in the 1880s associated with the Land War. 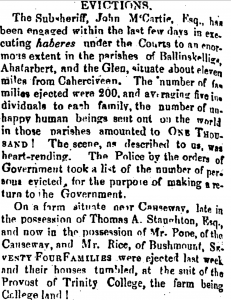 If any of my readers have knowledge of other evictions sites throughout Kerry during the 18th and 19th century, I would be glad to list them here. Fascinating. Had anyone found evictions in Ballylongford in County Kerry? How could I find them? 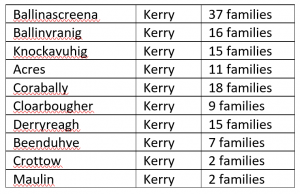 Hello, Kay: This article on Kerry evictions near Causeway is very interesting to me. My father grew up on a small farm near Acres, Ballyduff not far from Causeway. He emigrated in 1947 to Ohio where I was born and raised. Luckily they did not lose their few acres. 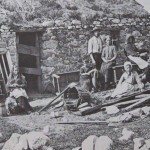 However there is a story passed down on my mother’s side that may indicate an eviction in the past, because her family ended up at the Cashen somewhere in the 19th century, trying to make a living as fishermen, but they were from somewhere else originally. Kay, You are the most tenacious lady I have ever dealt with in spite of my dead ends in Duagh, Rathea and Listowel! You are a “sleuthing Digger of Facts and Truth” , in an effort to bring factual events to all who seek! So very happy to have come across your path. Thank you for sharing that information. I’ve been looking at the 1850 Valuation records of Leanamore Townland in Aghavallen Parish (NAI microfilm ref MFGS/46/36, House Book ref# OL/5/1111). There are notes referencing 3 Sep ’47 on some of the pages. All of the pages for this village have structures that are marked “Down”. A rough count of the taxed structures that are marked down is 29 of 105 (~27.6%). This is a small village near Listowel which encompasses less than 1500 Acres. The majority of the taxes were paid to Pierce Crosbie who paid the Provost & Fellows of Trinity College. I plan to visit a Breen family relation in Lenamore in the next couple of months. She is still living on the land that her ancestors, Jeremiah and Patrick Breen were farming in 1847. My great grandparents emigrated in the 1890’s. I wish to learn as much as I can about the struggles of those who tried to hold on and lost along with those that succeeded. Any advice is greatly welcomed. John, I know you will really enjoy your visit and you are correct in saying that you should learn as much as possible of the local history of North Kerry before you arrive. This leads to a much better understanding and more balanced view of the past. Also if Google ‘Pierce Crosbie Landed Estates’ you will get a rundown on his family etc. A good book I would recommend- available in Woulfe’s Bookshop Listowel, is John D. Pierse’s Teampall Bán which is a book about the Great Famine in the area and also some land records. My own book Finding Your Ancestors In Kerry also has a lot of background to Kerry history in general. Thanks for new leads. The information is terrific because being from the U.S. I don’t know the history. I can’t wait to start the research. Hi Patricia…I’d like to make contact with you as we share an ancestry to Jeremiah O’Keeffe. Please contact me if you get this. I did not know about this terrible eviction era. Saddened about Trinity College being so involved. Jane, I don’t think there was anything inherently evil in the actions of Trinity. 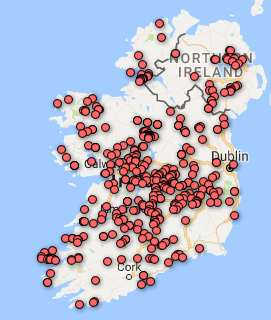 The background as described in Landed Estates: In 1666 the Provost, Fellows and Scholars of Trinity College, Dublin, were granted a total of 61,017 acres in the counties of Limerick, Kerry, Tipperary, Cork and Waterford. Most of this land, 54,479 acres, was in county Kerry. The College’s estates in county Kerry amounted to over 10,000 acres in the 1870s, including lands in the parish of Rattoo, barony of Clanmaurice and the village of Ballylongford, barony of Iraghticonnor. An offer was made by the Congested Districts Board on over 9600 acres of the College’s county Kerry estate after 1909. The real problem was that they appointed Agents, who in turn appointed Sub-Agents and you also had ‘middleman’ and the powers that be in Trinity over the years allowed these agents/middlemen to basically do as they pleased. Of course the Agents wanted to make a much money as possible so each layer in the renting process charged an extra levy and if you got an unscrupulous one, he (usually ‘he’) no mercy was shown to the unfortunate tenant. Well there WAS something inherently evil in the actions of Trinity. I am trying to find out where my husbands ancestors came from supposedly from the lake area. The family name is Reardon but on some documents it is spelled Riordan and on one Raridon. I now think that Michael Reardon immigrated between 1848 and 1850 to Boston. I am trying to find my Rooney family from Tralee. My great grandfather was James Rooney born abt 1853? in Tralee? and had a brother Thomas, born 1847. Both James and Thomas emigrated to New Zealand. Parents were Michael Rooney and Mary Meehan. I believe Michael, my great great grandfather also had a brother Edward (or Edmund) Rooney who married a Catherine Delaney in Causeway 1844. Two of their four sons emigrated to New York (James and Edward Rooney) and Michael and John who emigrated to New Zealand. I have been trying to find out more about Michael Rooney and wife Mary Meehan. Any information you can find would be so much appreciated. I have plans to visit Ireland in June next year which I am so looking forward to. I was so excited to find your website. My name is Martin. After 3 years, I finally had a breakthrough and found out my Irish ancestors came from Kerry. I was researching evictions in the 1880’s and came across your website. My ancestors emigrated to America in 1884, but I suspect that the Land War had something to do with their decision to leave. My maternal GG grandfather was Daniel Sheehan married Mary Leary near Sneem. I thought looking for records of the evictions would be a good place to start.